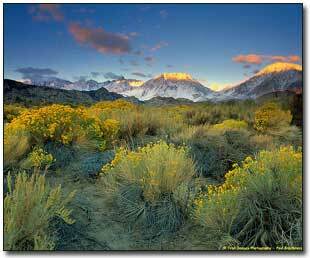 The Eastern Sierra region, also known as the Highway 395 corridor, is a long time favorite area for many photographers. Over the years well-known photographers such as Ansel Adams and Galen Rowell produced many exceptional photographs that anyone who visits the area will recognize. The Eastern Sierra region begins at the southern end of Highway 395 at Little Lake and continues up along the eastern spine of the California Sierra Mountain range to the town of Bridgeport in the north. This Highway has some of the most beautiful scenery in the state of California if not the world. The overall terrain spans a multitude of altitudes, climates, & foliages, as well as including low desert through high alpine environments. Two of the continental United States geological icons are located in this region, Mt. Whitney, the highest point in the lower 48 states at +14,497 feet high and Badwater, the lowest point, located in Death Valley National Park at -282 feet below sea level. Traveling on the path of the 395 corridor the main towns from south to north are; Lone Pine, Independence, Big Pine, Bishop, Mammoth, Lee Vining, and Bridgeport. Here are some photographic highlights surrounding these cities. 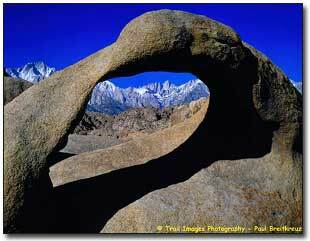 Lone Pine, the home of the Lone Pine Film Festivals held each year in October, includes photo sites such as, Mt Whitney, Alabama Hills, Horseshoe Meadows, Manzanar, and access to Death Valley National Park. Heading north the next town, Independence, is the local county seat for the area of Inyo County. One spot in particular that is often visited for photography as well as camping and hiking around Independence is Onion Valley. Further north is the town of Big Pine, site of the 'Big' pine tree donated to the town by avid environmentalist President Teddy Roosevelt. A right turn off Hwy 395 at the location of this tree will head you in the direction of the Ancient Bristlecone Pine Forest. This site has some of the most unique looking natural wonders in the world and provides some very interesting photos. Returning to Highway 395 heading north about 15 miles from Big Pine, brings us to the largest of cities on this scenic byway Bishop. All photo enthusiasts should stop and visit the Mountain Light Gallery located inside an old bank building at the intersection of Highway 395 and Line Street. The overall presentations of the works of Galen & Barbara Rowell are displayed in a photographic gallery that is second to none and highlights their love of this region as well as their former works from their worldwide travels. Photographic sites to visit around Bishop include Lake Sabrina, North Lake, South Lake, and the creeks that feed from them. Along with the water ways are the many aspen groves that provide excellent photo opportunities during the peak fall season. Venturing farther north brings you to some must see areas that provide a variety of terrain changes, altitude increases, and sometimes dramatic climate variances. Locations include Tom's Place or Rock Creek Canyon, McGee Creek, Crowley Lake, Mammoth & June Lake loops, and Tioga Pass. 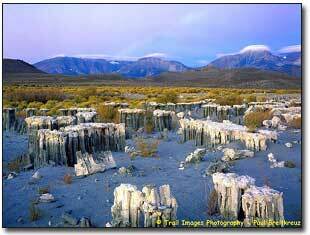 Upon arriving at Tioga Pass and the town of Lee Vining the key highlight is Mono Lake. Although the main attraction to this area is the lake itself and its South Tufa formations, there are other key sites to review and explore when trying to obtain various types of outdoor photos. This includes a side trip up the Tioga Pass to Yosemite when the season and the roads allow. Leaving Lee Vining heading north leads us pass Lundy Canyon to the top of Conway Summit and to the turnoff to the Virginia Lakes region. Although the lake areas themselves are somewhat confined for photo opportunities the maintained dirt roads around the area supply all kinds of side treks to a variety of aspen groves and other water flows. Back to the main highway and north places us at the turnoff to the Bodie Ghost Town, a real draw for all visitors including avid photo buffs. Continuing on the main highway to Bridgeport we reach the end of the main townships along this path before the main state dividing line into Nevada. 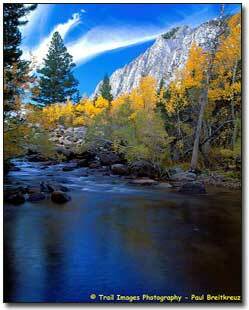 Photo opportunities in and around Bridgeport include Twin Lakes, Walker River region, and the Sonora Pass. As stated at the beginning of this article, the locations throughout this area for overall photographic possibilities are enormous. It is best to approach this region in small geographic chunks and at different seasons. To try and see all of this on one trip will result in a lot of road time and not enough time spent on your original intent obtaining quality photographs.